Creative Essence is a series of advance "how-to" books on bringing 3D characters to life. Future titles will look at other aspects of the characters, like modeling, rigging, clothing, etc. 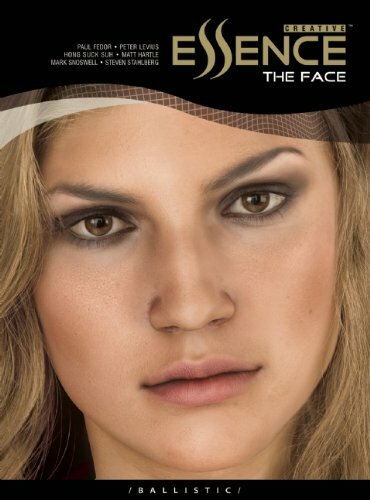 First of all, the goal of this book is to create a photo-realistic face. The tutorials in the book follows a picture-description format throughout. There are plenty of screenshots showing the workflow. The subjects cover the initial photography, modeling, texturing and rendering. The main bulk of the book is really on texturing and rendering. Right at the back are additional lessons on creating bruising and aging on the model. The good thing about the book is that the instructions are pretty detailed. They are also very high level requiring the reader to be a relatively advanced 3D user in the first place. Some of the artists involved have developed their own software tools to build more functionality into the default software set. There are several software used, such as Maya, 3D Max, ZBrush, FaceFen, etc. So unless you already have these in place, it is a pretty pricey setup just to learn to create a photo-realistic model. Unfortunately, the book doesn't come with the DVD, which must be bought additionally. I would recommend this book to professional users whose job requires them to create such highly realistic models. If you're looking to get started in facial modeling, check out Stop Staring: Facial Modeling and Animation Done Right. It's a great book suitable for beginners up to advanced level 3D users.